Riverside, CA 3/21/2012 – RJ Anderson and the Walker Evans Racing (WER) team headed to Lake Havasu, AZ last weekend and it wasn’t because they wanted to partake in the spring break madness. No, RJ and the team had work to do and work is exactly what they did. 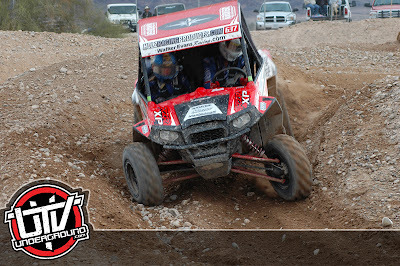 After coming up short in round 2 RJ was ready for a win in the Production 1000 class in his Polaris RZR XP900. With his Holz Racing built machine fully prepped RJ lined up next to 30 other class racers and took them all to school putting in the races fastest lap time and winning in dominating fashion. RJ was a full minute ahead of the second place finisher when the checkered flag dropped dominating the class and the race. With this win RJ moved into first in points giving him added confidence and motivation heading towards round 4 of the series. Needless to say, RJ fully enjoyed the tight and rough course at Crazyhorse Campground in Lake Havasu, AZ. In other news, Walker Evans Racing is proud to announce that RJ Anderson will now be racing with the Stronghold Motorsports team for 2012 at the Lucas Oil Off Road Racing Series (LOORRS). This is a huge move for RJ and his #37 ProLite race team as he now will be racing beside new teammates Jeremy McGrath, Cameron Steele, and Jeremy “Twitch” Stenberg. Stronghold Motorsports is the premier racing team in short course off-road racing. We are proud to announce that RJ Anderson’s new personal race site has been launched! RJ37.com will be where RJ and his team will keep fans, sponsors, and those interested on what and where RJ is competing in the know. Its a great way to keep everyone informed on his progression throughout the season and his career. So go visit RJ37.com often and keep up on all things RJ Anderson.